MANCHESTER, ENGLAND, 2017-Apr-10 — /Travel PR News/ — Cathay Pacific has announced that it will be bolstering its frequency in the North West by offering daily flights between Manchester and Hong Kong as of 1 December 2017. The extra services will operate on Sundays and Wednesdays. 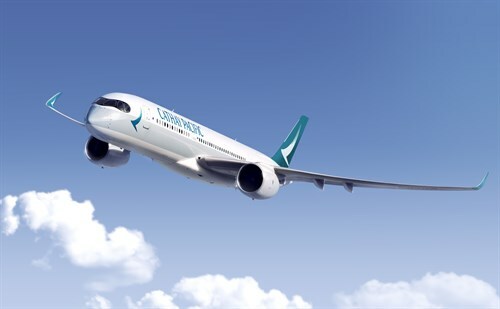 Having announced at the end of last year that it would be increasing its current four-times-weekly schedule to five-times-weekly as of 2 June this year, Cathay Pacific is further increasing the frequency to a daily service to meet growing customer demand in the region. Neil Glenn, Cathay Pacific General Manager for Europe, commented: “Our frequency increases are a direct result of responding to the needs of our customers. Since we initially launched the route in December 2014, we’ve been delighted with how popular it has proved. Stephen Turner, Commercial Director at Manchester Airport, said: “For Cathay Pacific to recently announce an increase to five flights per week was excellent news in itself, but for them now to go to a daily service from December clearly showcases the strong demand for the route. “In just a few years the route is performing extremely positively and allows the 22M people in our catchment area easy, direct access to Hong Kong and beyond. Featuring the airline’s latest products in Business, Premium Economy and Economy Class, the new A350-900 encapsulates Cathay Pacific’s brand promise of a “Life Well Travelled”. In addition to the latest seats and an enhanced inflight entertainment system, the aircraft is Wi-Fi equipped, meaning passengers can stay connected throughout their journey. Neil said: “Our additional Airbus A350-operated flights between Manchester and Hong Kong underline the deep-rooted commitment we have to providing both business and leisure passengers with increased convenience and superior in-flight products. This brand new aircraft gives travellers even more reasons to choose Cathay Pacific and enjoy a life truly well-travelled. The sale features a wide range of destinations including Australia, New Zealand Hong Kong, China, South and North Asia (including Indonesia, Malaysia, Cambodia, Thailand, Vietnam, South Korea, Japan and Taiwan) for selected dates up until March 2018, with some great fares available. To book visit www.cathaypacific.co.uk. The sale ends on 4 May 2017. This entry was posted in Airlines, Airports, Business, Flights, Travel, Travel Management, Travel Services, Travelers and tagged Cathay Pacific, hong kong, Manchester, Manchester Airport, Neil Glenn, Paul Stowers, Stephen Turner. Bookmark the permalink.